“Enough is enough” ain’t cutting it…it’s time for a very firm: No! All the food that was in this yard is now gone, the raspberry canes, the asparagus, all the plants that could have been given new homes, now dying in a garbage dumpster. Picture a neighbourhood vegetable garden. A corner lot, a small house, and a big yard; one part of the yard filled with golden raspberries, lettuces, kale, tomatoes, onions, asparagus, sunflowers; the other part dominated by an apple, a plum, and a cedar tree. Now imagine all of that bulldozed over. That’s exactly what happened today at the property across the street from me. When my neighbour, who’d been there for more than 15 years, first mused about selling his house, a chill went down my spine. I asked him then if I could save as many of the perennial fruits and veggies as I could (he’d also saved and transplanted into his yard a bunch of the asparagus from the Carlington Community Garden, which shut down last year). He said no problem. It took more than year, but the house finally sold. 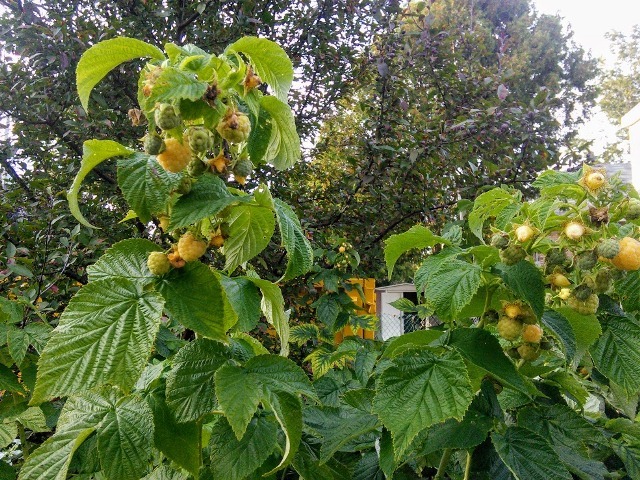 A friend of mine and I were able to transplant about a dozen of the golden raspberry canes at the end of August before my old neighbour left. The new owner took possession September 1 and within 24 hours, the apple tree was gone. The guy hired to take it out, hacked at it with a chainsaw then used the chainsaw like a weed wacker to the rest of the vegetation in the front (which had included strawberries, chives, and onions). I went over that same day to introduce myself to the new owner and to ask him what him about his plans for the house. Taking it down and putting up two, was his answer. What a surprise. Not. In Kitchissippi ward, whenever a house goes up for sale, it’s a done deal that the house will be torn down in favour of two or three ugly, cookie-cutter houses that have zero character, pavement as far as the eye can see, and some of them so poorly built that they will likely be falling apart within a decade. Still, I kept my feelings in check and the new owner and I had a pleasant chat. He also gave me his permission that, over the next two weeks, I could get a crew in to transplant as many of the plants as I could. It’s his own property; I know I have no legal say in what he does. But this garden, this little treasure has been in the neighbourhood for more than 15 years. The garden had become like an old friend for many of us, and the former owner always encouraged his fellow neighbours to pick whatever they wanted. And we did. But in less than 20 minutes, all those years of work, all those years of growth were gone. And for what? The house can’t even be demolished until next year, so what was the rush? I was out on my porch and ran over as soon as I saw what was happening. The new owner shrugged and mumbled something about having permission to do so. Yeah, well, pardon my French, as we used to say, but screw your permission buddy. Does anyone understand what a community actually is anymore? It’s people. It’s people doing for others. It’s people who appreciate what their neighbours do for them and what they contribute to a neighbourhood. The work and love that went into that beautiful garden obviously doesn’t mean squat to a developer who doesn’t live anywhere near here, only wants to ride the Westboro development train as long as it holds, then bugger off to some McMansion elsewhere in the city. I can only daydream that the new owner lives on a flood plain and that his insurance rates are through the roof. But it took less than 20 minutes to bulldoze years of love. There wasn’t even time for me to save anything and right now I am so angry I can’t see straight. I work from home, I live right across the street, I will be watching every step, every move made at this property. And if I have anything to say about it, two houses won’t be going in there. I don’t know what it’s going to take to make people understand that what we are doing to this city is just plain wrong. I am not against all development; I am not against all change. I am against change and development that makes no sense, that pits neighbour against neighbour, that makes a community no longer a community in the proper sense of the word, but instead, some dismal place you drive away from everyday, then rush home, close the drapes and shut yourself off from everyone else.